The seventh season of the fantasy drama television series Game of Thrones is set to premiere on HBO ... on July 16, 2017. Unlike previous seasons that all consisted of ten episodes, the seventh season will consist of only seven episodes. Like the previous season, it will largely consist of original content currently not found in George R. R. Martin's A Song of Ice and Fire series, but also adapts material from the upcoming sixth and seventh novels The Winds of Winter and A Dream of Spring. The series is adapted for television by David Benioff and D. B. Weiss. 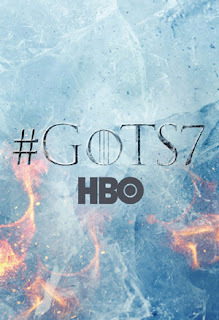 HBO ordered the seventh season on April 21, 2016, just three days before the premiere of the show's sixth season, and began filming on August 31, 2016. The season was filmed primarily in Northern Ireland, Spain, and Iceland. Game of Thrones features a large ensemble cast, including Peter Dinklage, Nikolaj Coster-Waldau, Lena Headey, Emilia Clarke and Kit Harington. The season will introduce several new cast members, including Jim Broadbent and Tom Hopper.